Kiehl's Creamy Eye Treatment With Avocado | £20 for 14g or £33 for 28g // I have mixed feelings about this eye cream. First of all I bought the larger size as the smaller pot was out of stock and I was in desperate need of something incredibly moisturising after an allergic reaction to a different product left my skin flaking and my eczema flared up. Such a small amount of product is needed that I don’t think I’ll be able to finish this tub before it goes off as it isn't a product that I use on a daily basis. I have very sensitive skin, especially around my eyes, so this eye cream is too thick and heavy to be used on a daily basis for me as milia tend to flare up if I do. Instead for me this is more of an eye treatment and quite an expensive one at that especially if I'm not able to use up all of the product. I also don’t like how this applies and sometimes it can feel like it’s just sitting on the skin instead of sinking in, therefore I tend to use this at night. When you apply a layer of this, the cream almost turns into a liquid and feels quite watery which feels a bit odd on the skin and almost like it isn't able to absorb into the skin. It did work wonders on the allergic reaction I had but since then the skin around my eyes hasn't been dry so I haven’t needed to use this and it’s just been sitting in my cupboard. If you can, I’d recommend getting a sample of this before buying the full size so you can properly test it out yourself. I wish I had done this as I would have saved myself a few pennies and the sample size probably would have been the perfect size for the amount of time I used this. 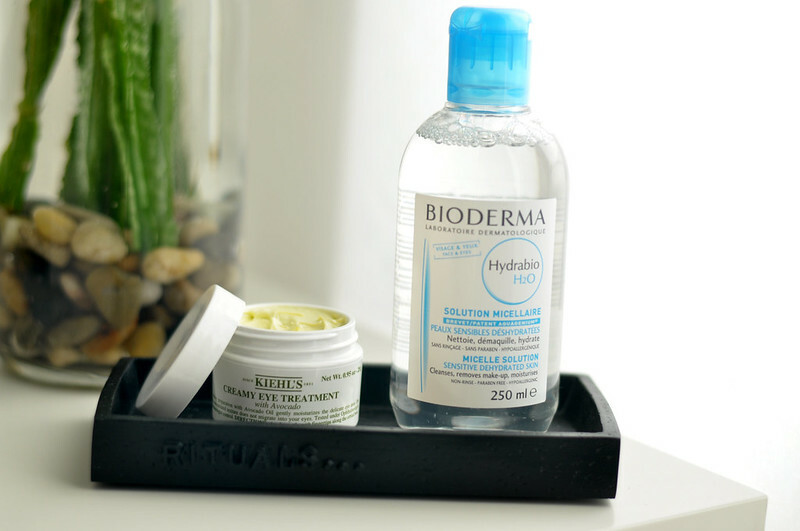 Bioderma Hydrabio H20 Micelle Solution | £9.99 // I love the Sensibio Micellar water from Bioderma (pink lid) but I thought I'd try the Hydrabio version just to see how it compares. This version is designed for those with sensitive and dehydrated skin which describes my own skin although the Sensibio version works fine with my skin type as well. I don't use a micellar water as a cleanser nor do I use it to remove a full face of make-up on a daily basis because I just don't wear it. What I do use it for, without fail, on a daily basis is to remove mascara which is usually all I'm wearing. Therefore I can only really comment on how this works as an eye make-up remover. I never though I'd say this, but this actually removes eye make-up better than Sensibio. I pour some onto a cotton pad, only a little is needed, and then hold it against my eye lid for only a couple of seconds and make-up just melts away. I also don't need to rub or wipe at my eye because it's all gone. This means less product is needed and for the same price, this bottle will last longer. It also works amazingly well at removing stubborn eye liner or waterproof mascara. I have pretty sensitive eyes and this doesn't irritate them at all. Although I'm still loving the Garnier equivalent, I'll be reaching for this one in the future if I fancy a change and buying a bottle of Bioderma. I've been looking for a new eye make up remover, the Garnier one irritates my eyes :( but I'll definitely give this Bioderma a go! I've read mixed reviews on the Kiehl's eyecream and I am still not sure whether to take the plunge or not. One thing a friend recommended was to apply it with wet fingers so that it helps to sink in faster!